Introduction to the Special Theme "Safety-Critical Software"
New CWI spin-off MonetDB B.V. Application of formal methods in standardization and industrial forums. The workshop included six sessions of regular contributions in the areas of model checking, testing, software verification, real-time performance, and industrial case studies. There were also three invited presentations given by Steven Miller of Rockwell Collins, Rance Cleaveland of Reactive Systems Inc., and Werner Damm of OFFIS, covering the application of formal methods in the avionics and automotive industries. In addition, a panel discussion was organized on the topic "Formal Methods in Commercial Software Development Tools." The panel included the three invited speakers, as well as researchers Mark Lawford and Pedro Merino. This session produced a lively discussion about current and foreseen applications of formal methods within model based development frameworks that include formal analysis and code generation methods for software design. From left: Alessandro Fantechi, Marko van Eekelen and Pedro Merino. Out of the 36 contributions submitted to FMICS 2008, the Program Committee had the difficult task of selecting 14 papers for the presentation at the workshop, as well as two short presentations which served as an introduction to the panel discussion. A post-workshop proceedings volume containing revised versions of the papers presented at the workshop will be published by Springer Verlag in the Lecture Notes in Computer Science series. A tradition of FMICS workshop is that the best presented paper receives an award from EASST, the European Association of Software Science and Technology. This year, the award was given to Marko van Eekelen from Radboud University of Nijmegen (NL) for the paper "Reentrant Readers  A Case Study Combining Model Checking with Theorem Proving," written together with Bernard van Gastel, Leonard Lensink and Sjaak Smetsers. 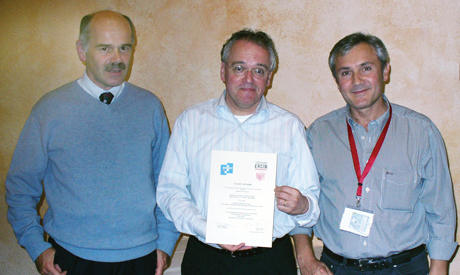 The award was presented by Pedro Merino, FMICS Working Group coordinator from November 2005 to November 2008, and Alessandro Fantechi, one of the chairs of the 2008 workshop and new FMICS Working Group coordinator (see photo).